The Goodwill of Southern Nevada is looking for a part-time associate to assit with their Gift Card Program! Applicant must be 17+ and able to start as soon as possible. The associate will be responsible for delivering services, assisting in creating and implementing a marketing plan, add new partner agencies, track gift cards and assist with special projects. This is a paid position and upon successful completing of the program an education award will be given to the member. If you are interested in the position please contact Michelle Redmond at 702-892-2336 or via email at MichelleR@uwsn.org. Accepting applications until 11/30/09. This upcoming Tuesday November 10 will be the annual Project Homeless Connect at Cashman Center. It will be the largest community collaborative in Southern Nevada. The event will help more than 3,000 clients receive the most vital social services from haircuts to pet care. VOLUNTEERS ARE STILL NEEDED!!! Click here to get involved now and be a part of this amazing event. Today was the FIRST ever Tony Hawk Foundation Fundraiser in Las Vegas, NV at Wynn Las Vegas. I recently learned about the TH Foundation through a friend at the Andre Agassi Foundation. They said that the Foundation was in need of volunteers for their upcoming “Stand Up for Skateparks” event. I gladly signed up knowing that Tony Hawk is heavily involved in the community, but boy was I surprised to find out just how much he gives! The Foundation “…seeks to foster lasting improvements in society, with an emphasis on supporting and empowering youth. Through special events, grants, and technical assistance, the Foundation supports recreational programs with a focus on the creation of public skateboard parks in low-income communities. 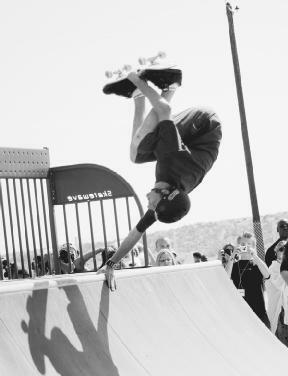 The Foundation favors programs that clearly demonstrate that funds received will produce tangible, ongoing, positive results.” To date – 319 Tony Hawk Foundation grant recipients have opened their skateparks and are currently serving an estimated 2.9-million children annually. With the remaining grant recipients scheduled to open their parks in the next 12 months, an estimated 3.9-million young people annually will use facilities that received financial aid and development guidance from the Tony Hawk Foundation. The event today was amazing. Wynn Las Vegas graciously hosted and the volunteers (that’s me 🙂 were treated VERY well. The Tony Hawk Foundation employees were organized, helpful, and kind. The notable guests in attendance were Erik Estrada, Holly Madison, Aubrey O’day, Tony Hawk (and family), Rancid!, Chuck Lidell, Gray Maynard, Dana White, Lyn-Z Adams Hawkins, Bucky Lasek, and a few more that escape me right now. There were TONS of giveaways for guests like hats, shoes, UFC bags full of goodies, skateboard decks, and of course amazing food. There was a skate demo (the vert ramp was built on top of Wynn’s pool!). To top it off there was a live auction with packages such as a day with Miley Cyrus, private soccer lessons with Mia Hamm, a Tony Hawk one of a kind Dodge charger, Lance Armstrong signed bike!, and vacation packages at 5 star destinations! Talk about a spectacular event and all to benefit youth!!! The reason why today is note worthy for the Volunteer Center of Southern Nevada is because I got a huge compliment from a TH Foundation employee. The day was very long, 9-4, but it flew by to me. I really enjoyed the other volunteers and was genuinely blown away by the generosity of those in attendance. A TH Foundation employee noticed this and asked where I worked. I told him that I was an AmeriCorps member and after explaining what I do he commented that he had never worked with a volunteer so willing to help and friendly with everyone. I would love to take credit for that, but my passion to serve and ability to serve well is really due to my role models from the VC. It always feels good to positively represent your roots and have someone notice. Can you tell how much I loved today?! For more information on how YOU can get involved with the Tony Hawk Foundation please click here. You are currently browsing the United Way of Southern Nevada Volunteer Center blog archives for November, 2009.